Cardiovascular disease remains the single most common cause of death in end-stage re­nal disease (ESRD), with cardiovascular mor­tality 30-times higher than in matched indivi­duals from the general population. The risk of arrhythmia-induced death is also very high. Although atrial fibrillation (AF) is the most common arrhythmia in patients on maintenance hemodialysis (MHD), supraventricular tachy­cardia (SVT) is also frequently encountered. SVT may be regular or irregular. Regular SVT includes atrio-ventricular nodal re-entrant tachy­cardia (AVNRT) and atrio-ventricular re-entrant tachycardia (AVRT). The incidence of AVNRT in the general population was reported to be 0.2%. The com­mon clinical presentation is paroxysmal palpi­tations. Management strategies of AVNRT include medical and surgical therapies. Over the last decade, radiofrequency catheter abla­tion has been the treatment of choice. We present here a patient on MHD with recur­rent AVNRT who was successfully treated with radiofrequency catheter ablation. A 54-year-old hypertensive patient on MHD thrice weekly presented with episodes of palpitations during hemodialysis sessions and was diag­nosed as recurrent AVNRT. The episodes of palpitation were not associated with angina and/or hypotension. The dialysate used was of standard formula and the urea reduction ratio was 0.66 and Kt/V was 1.2. The access was right internal jugular permcatheter, the tip of which was at the junction of the right atrium and the superior vena cava. Serum analysis for sodium, potassium, cal­cium, phosphorus and magnesium were nor­mal. 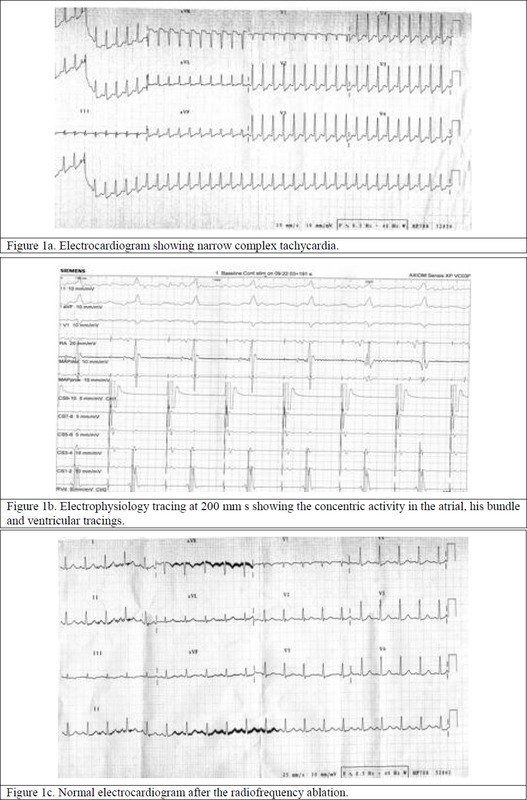 Electrocardiogram showed narrow com­plex tachycardia [Figure 1]a. The echocardio­gram and coronary angiogram results were normal. Serum parathyroid hormone was 112 pg/mL. The episodes of recurrent AVNRT were managed with intravenous adenosine, amiodarone (200 mg/day) and verapamil (80 mg/day). Compliance with drugs, diet and weight was ensured. The interdialytic weight gain was 1-1.2 kg between two sessions. Initially, right jugular permacath was thought to be the triggering stimulus for AVNRT; hence, it was removed and the hemodialysis was continued through left radiocephalic fis­tula. Despite the conservative measures, remo­val of permacath and drug compliance, he con­tinued to have recurrent attacks. Hence, he was planned for radiofrequency ablation (RFA). RFA was performed through the placement of four electrode catheters in the right femoral and left femoral veins. Narrow complex tachy­cardia was induced by atrial extrastimulus and isoprenaline infusion [Figure 1]b. Radiofre­quency energy of increasing power, duration and temperature were applied. Ablation was done at a temperature of 47°C and power of 40 W for a duration of 60 s. Successful ablation was confirmed by the inability to induce SVT by the atrial extrastimulus method and isoprenaline infusion [Figure 1]c. At the end of one year of follow-up, he continues to have normal sinus rhythm and is not on anti-arrhythmic agents. Arrhythmias are frequent in the dialysis popu­lation. The most common arrhythmia is atrial fibrillation as seen in the general population. Ajit et al reported the incidence of SVT and ventricular arrhythmias in MHD to be 53% and 27%, respectively. The most common SVT is AVNRT. The incidence of AVNRT in patients with narrow complex tachycardia is reported to be 50-60%. But, AVNRT is not frequently reported in patients on hemodia­lysis. AVNRT is also seen in patients with rheumatic heart disease, pericarditis, myocar­dial infarction, mitral valve prolapse and pre­excitation syndrome. Normally, AV node has a single conducting pathway that conducts impulses in an antero­grade manner to depolarize the bundle of His. In some people, two conducting pathways with different electrophysiological properties exist: (a) slow pathway (alfa pathway), which is a slow conducting pathway with a shorter refrac­tory period and (b) fast pathway (beta path­way), which is a rapid conducting pathway with a long refractory period. Electrophysiolo­gical studies demonstrated dual AV nodal path­ways in 40% of the patients. In patients with typical AVNRT, P wave is usually located at the terminal portion of the QRS complex and the PR interval is longer than the RP interval. In atypical AVNRT, the RP interval is longer than the PR interval. During dialysis, the arrhythmogenic milieu is created by various factors that include elec­trolyte abnormalities (potassium, calcium, phos­phorus, magnesium and other divalent ions), fluid retention, pre-existing heart disease, car­diomyopathy, anemia, left ventricular struc­tural abnormalities, obstructive sleep apnea, sympathetic overactivity  and vascular catheter in the right atrium. The clinical features are highly variable with complete absence of symptoms to heart failure and hemodynamic collapse. Palpitations are most frequently re­ported, usually associated with high ventricular rates. RFA is the treatment of choice for AVNRT. RFA is defined as the use of an electrode catheter to destroy small areas of myocardial tissue or the conduction system or both that are critical for the initiation and maintenance of cardiac arrhythmia. Radiofrequency energy of 50 W power for a duration of 50-60 s with a frequency of 500,00 Hz is normally delivered. Elevation of tissue temperature leads to denaturation of proteins and formation of coagulum, which causes a sharp rise in impedance and fall in current density and limits further lesion growth. Catheter ablation is indicated in patients with severe symptoms, symptom-matic pre-excitation syndrome, incessant tachy­cardia and intolerance to medical treatment. At the end of one year, there are no further episodes of AVNRT and the patient is in normal sinus rhythm. We recommend that appropriate evaluation of palpitations of pa­tients on dialysis is mandatory and, when indi­cated, AVNRT can be successfully treated with the RFA method. 1. Voroneanu L, Covic A. Arhythmias in hemo­dialysis patients. J Nephrol 2009;22:716-25. 2. Narula AS, Jha V, Bali HK, Sakhuja V, Parupu RS. Cardiac aarhythmia and silent myocardial ischemia during hemodialysis. Renal Fail 2008;22:355-68. 3. Yavascan O, Mir S, Tekguc H. Supraventri­cular tachycardia following insertion of a central venous catheter. Saudi J Kidney Dis Transpl 2009;20:1061-4. 4. Calkins H, Kumar VK, Francis J. Radiofre-quency Catheter ablation of supraventricular tachycardia. Indian Pacing Electrophysiol J 2002;2:45-9. 5. Ratajewska AM, Banachowicz WW, Grzegorzewska AE. Recurrent atrioventricular nodal reentrant tachycardia with percutaneous abla­tion in a 75 year old patient undergoing inter­mittent hemodialysis. Int Urol Nephrol 2009; 41:225-30.